Make sure you have a range of products. It's best to streamline what you can make and then to work on those items. Creatives are often tempted to make as much as possible, but I suggest picking your best products and producing a few of each, that way as one sells you have more to restock with. By focusing your creative efforts you can get a more well rounded selection instead of too many one off items. 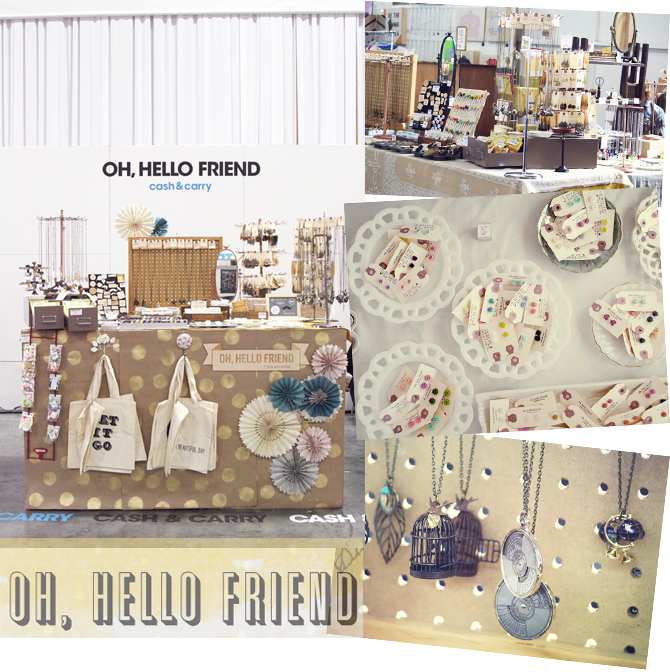 Danni from ohhellofriend is really great at building her product ranges and stock. Her stand set-up is also an inspiration! She is a regular on the market and fair scene in the States, she has honed her craft skills with practice and creative planning! I like to always look at the stalls and stands of others to help me come up with new and interesting ideas. I do, however always say - be inspired, but don't copy even if what you are admiring belongs to that of an overseas seller. It's great to develop your own creative thought process through analysing inspiration. Dimension: Displays work best when you add different levels and heights to your products. The higher levels at the back and the lower ones in the front. Upside down crates, cake stands and boxes work well for creating dimension and levels. Variables: Try to find out where your stand or stall will be. This will help with your planning. Keep in mind that weather conditions change at outdoor markets or lighting in halls and venues can differ for indoor shows. Do you need additional lighting and are you near a plug point? Try to be aware of the unknown variables and plan as best you can to be adaptable and flexible. Showcase you Products: The whole reason of the market is that you want to sell your products, therefore the outcome of your stand set-up is to showcase your products in the best possible way. Think of ways that show-off your items. Stands, boxes, card holders...look at things from the point of a potential shopper and make it easy for them to access and view products. If you sell accessories like necklaces are they easy to view and try on? Or if you sell stationery like pens, do you have a tester available? We are all consumers and customers at some point, use the knowledge of what you like or need to assist in your layout planning. Packaging & Interesting Displays: Creatives love beautiful packaging and it definitely helps to sell products. Make sure your packaging or tags are the best that they can be. Group similar products together. You can use various things to hold them. 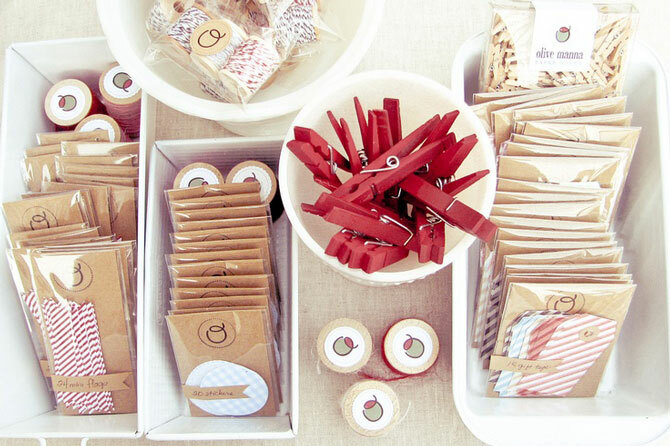 I particularly like how Olive Manna used baking tins, which they sprayed white to hold these stationery items. Their packaging is simple, yet effective. Be creative and scour second hand shops for interesting and unusual display items. 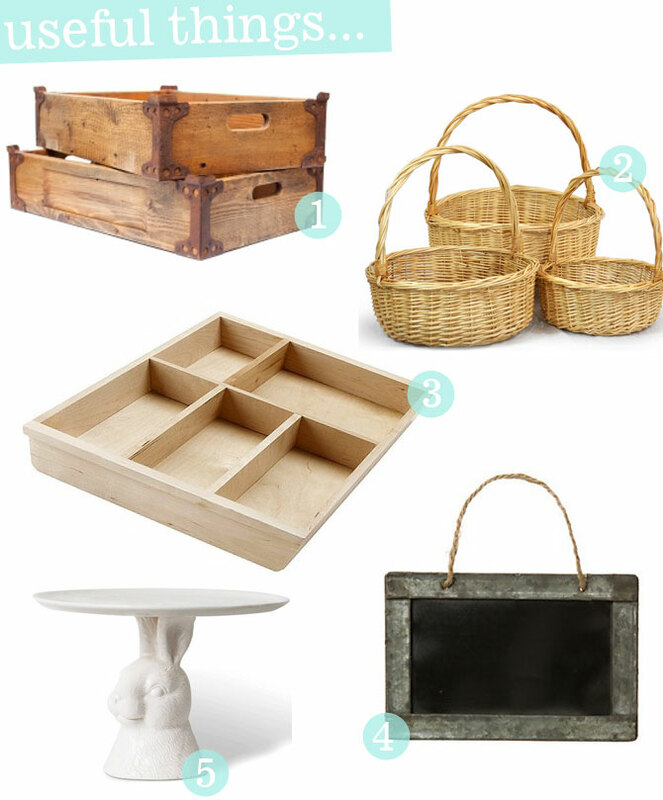 Look around your home, many decor items can be great for displaying too. Shopfitting stores often sell second-hand stands or interesting baskets which are great. In Durban I always visit Shelve Master in Umgeni Road, as they have loads of older, unique display pieces. Remember things like egg cups, muffin trays, wire baskets, cute containers and empty drawers are all handy! Practice: Over time you will know just how to display your products best. Keep at it and always evolve and grow. As you are learning, don't be afraid to set-up a mock market table at home in order to see what will work best. Also... take a look at the Renegade Craft site! 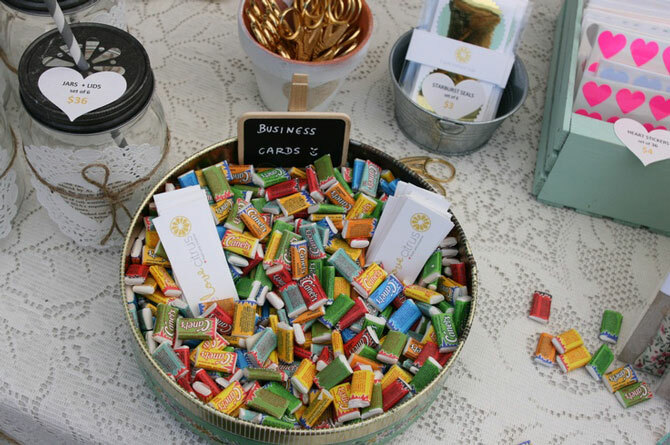 Don't forget to have the name of your business on display as well as your business cards! 2 / Baskets: These are useful for a collection of similar things. Wire or metal baskets are perfect too. 3 / Cutlery Dividers: Ideal for smaller items and grouped products. 4 / Chalk Board: To display prices or facts. 5 / Cake Stands: They add dimension and levels. Lastly, keep on researching and be unique. Pinterest is full of ideas and boards from creatives who are also planning for markets and fairs! Bronwen from Once prepped her table at home to show her ideas. Jeanee from a brand called Dirty Laundry wrote a downloadable book about craft show set-up. I particularly enjoyed this Pinterest board from Ginger Kelly Studio. 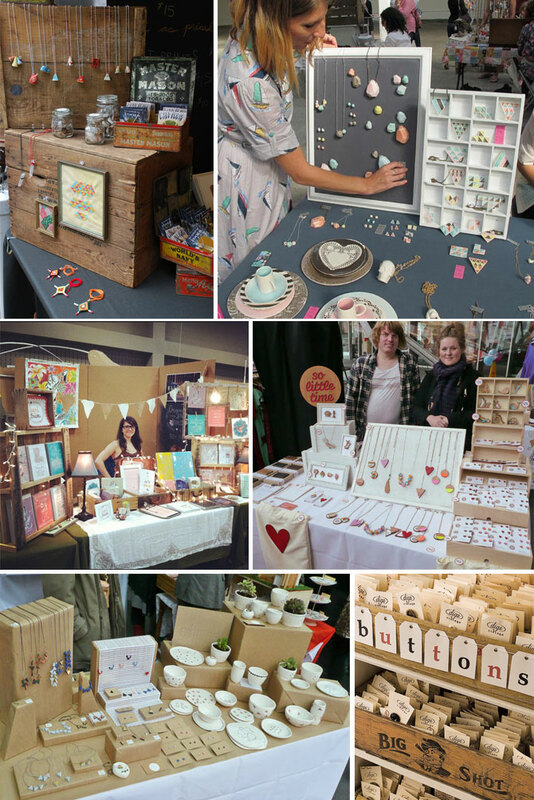 Here is a post on Six Tips to Become a Craft Show Superstar. Another post showing tips and inspiration on a blog called Maiedae. You too can share your creative business question - just email me and let's all learn together! Thanks so much for this very useful post Nadia! I've also recently joined the craft market business, and this is just a super post ^^. It's a fantastic idea to choose a theme and do a table layout according to that. An interesting (not messy) table layout evokes curiosity and it almost makes people want to come over to your table. Thanks for just being the most inspirational blogger! This is perfect, thanks so much for the great information and inspiration!